Waitrose faces the accusation of making racist duckling Easter eggs. Ahead of this year's Easter, UK based supermarket, Waitrose & Partners pulled a variety of new Easter chocolate products for their customers. The new Easter chocolate box priced at £8 consisted of three ducklings shaped chocolate with each one being in three different colors. As the one in milk chocolate color was labeled, 'fluffy', the other one in yellow color was titled, 'crispy.' Likewise, the third one which was dark chocolate was labeled as 'ugly'. Recommended: This is Not a Drill - It Turns Out Heinz’s Creme Egg Mayonnaise Is Real! Now, Waitrose is apologizing its customers after receiving accusations of being racist. 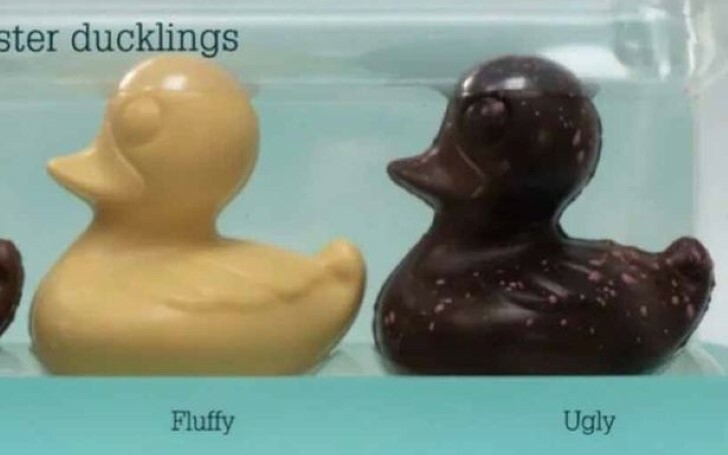 Apparently, the customers complained Waitrose for naming the dark chocolate duckling as 'ugly'. One person on Twitter wrote: "Look....maybe I'm a bit delirious from working on this book but the ridiculousness of these names made me giggle? Yes, offensive and should have really been thought through (hey - hire POC, marketing depts) but also these are just really bad flavor names?" Likewise, another one posted the picture of the duckling and commented: "They’re chocolate ducks, there isn’t any reason for them to be named. There are bigger issues of course but that doesn’t mean micro-aggressions shouldn’t be called out for what they are. At best, why not crispy, fluffy and tasty instead of calling the darkest animal ugly?" Whilst another added: "Well if one is Crispy, the other is Fluffy why name the darkest one ugly? They could have called it Healthy as dark chocolate is more healthier than milk or white chocolate or Yummy, truthfully they are All Ugly and bad for the teeth." 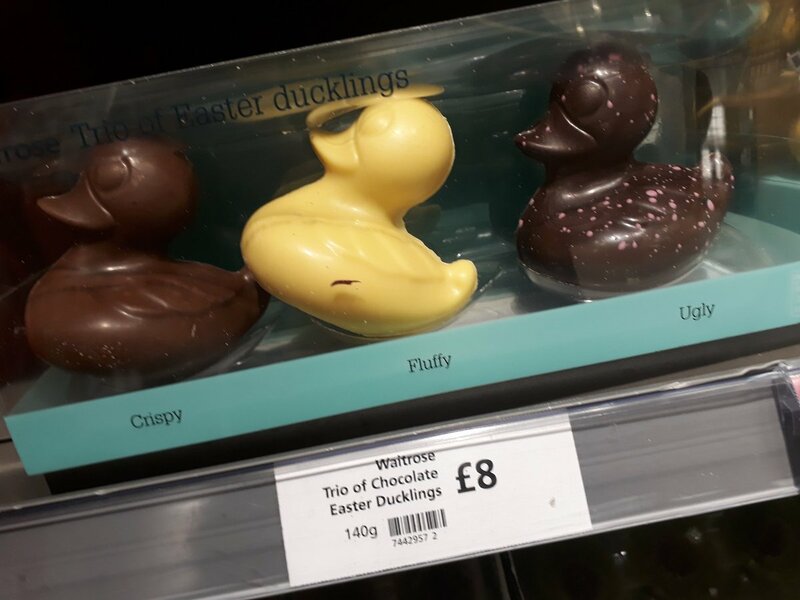 This one person made trolled Waitrose saying: "all stores: “chocolate ducks” this store: names chocolate ducks “fluffy, crispy, ugly." The other added: "This implies black is ugly & not a true or good message. This was intentional to generate media hype as the majority of Brits are white so the view will be it’s silly that this could be seen as racist. Therefore the hype will not see them in a bad light. Very clever"
Some of the people in the complaints also related the ugly duck to the classic fairy tale song, The Ugly Duckling by Hans Christian Andersen. The story details a brown duckling who is perceived as an ugly creature until it grows into a beautiful swan. Soon after receiving the complaints, Waitrose temporarily stopped selling the duckling and later redesigned the package by removing the names. Newly redesigned ducklings are on back on the shelves. A representative from Waitrose apologized saying: "We are very sorry for any upset caused by the name of this product, it was absolutely not our intention to cause any offense. We removed the product from sale several weeks ago while we changed the labeling and our ducklings are now back on sale." On the contrary, some of the Twitter users claim that there was no necessity to make a big fuss out of the chocolate's and its color.